Johannes Andersen for Uldum Møbelfabrik, 'Juliane' set of 16 dining chairs, teak and leatherette, Denmark, 1960s This large set of 16 dining chairs is designed by Danish Johannes Andersen and produced by Uldum Møbelfrabrik in Denmark. The set is executed in teak and upholstered in a faux black leather upholstery. The legs are tapered. The back is carved and has a beautiful, organic sculpted form that branches out from the middle in a thicker slat that is attached to the seat. The upholstery shows signs of age and use, and therefore reupholstery is necessary. This can be done in any kind of leather of fabric you desire. Please ask our advisors for more information about the almost endless possibilities for reupholstery that our atelier has to offer. The professional and experienced craftsmen in our in-house atelier are specialists in the reupholstery of design furniture. With high attention for the original, they make sure every piece retains its value. 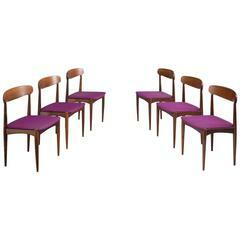 Set of four Model 7171 'Juliane' dining chairs designed by Johannes Andersen and made in Denmark by Uldum Mobelfabrik. Frames in solid teak, seats with beige textile upholstery. Set of 5 teak wood chairs "Juliane" by Johannes Andersen with brown Leather, Denmark, 1960s. Measures: SH 78 cm, T 53 cm, B 50 cm, SH 45 cm. Very good condition. Four sophisticated model 101 dining chairs designed by Johannes Andersen for Vamo Sonderborg. Wonderfully crafted organically shaped teak frames.